It’s the year 2069. Greed, conflict, neglect and excess have exhausted the world. JohnnyReb is either loved or hated. While he has a huge fan base – particularly one fan named Arch who is desperate for JohnnyReb to listen to a riff he has composed – JohnnyReb reacts typically by violently kicking at the instruments on stage. He is captured and taken away kicking, and is prohibited from performing at the concert. Shortly thereafter, a sound technician with a large droopy mustache, Stache, saunters in. He has been asked by a close friend who is CEO of a technology company to hand out a free promotional device to the musicians. The gadget, named the iHalo, is able to accomplish almost any high-tech task ranging from communication to holographs. He sees a hot young rocker, Velvet, and decides that the device would serve as a great introduction and gives it to her. Stache rises, dusts himself off and calls out for survivors. In a pile of debris, a familiar beam of light is flashing intensely. It’s Velvet, trapped, but alive with the iHalo flashing, and Stache helps her up. In another pile of debris, JohnnyReb lies entangled with his chief critic, Danielle. JohnnyReb is revived and he and Danielle’s closest friend, Banjovida (who has a crush on her) resuscitate her and she expresses her gratitude and surprise to JohnnyReb for saving her from the falling girder. The challenge is that it weakens at full moon. Given that music is their talent and passion, he must build a generator which will amplify and channel the sound waves into the dome. In this way they will ensure their survival. He also startles everyone by mentioning that there is a group of individuals on the outside, the TechnoRemnants, who have been jealously eyeing Rockville. Their leader is Ice, the one who provided the iHalos that Stache was handing out at the Festival. Stache and Ice have ambitions to take over Rockville and Stache uses Velvet to pass information about Rockville to Ice. She records the proceedings of the Council meeting, especially the fact that the force field degenerates at full moon, and passes it onto Ice. He informs those close to him that he has a plan and an ‘inside man’. Glaze is agitated and is desirous of more urgent action. Banjovida sees this and is crushed. Stache approaches him and insinuates that there is something going on between JohnnyReb and Danielle, which upsets him even more. Starr’s generator is successful in generating an additional force field for the dome, created by resonating sound waves of their music. If the music dies they die. Situated in his ‘inner sanctum’ the apex of the pyramid, rises from his bed as he hears the beep tone of the message from Velvet. His two lovers, Janice and Freeza, wake up as well and Ice reveals all to them and summons a meeting with all the TechnoRemnants to announce the take-over of Rockville. Back at Rockville, Cliff jumps to the conclusion that the only traitor (the “inside man”) present has to be JohnnyReb. Papa asks Stache to summon JohnnyReb and he says he’ll call him to meet at the generator. Johnny’s biggest fan, Arch, who is still pursuing him relentlessly, hears that Johnny is on his way to the generator and hopes to get him to listen to his riff. While he waits in the shadows, he witnesses Velvet being bludgeoned by a disguised figure (who he recognizes as Stache). As Velvet lies dying, JohnnyReb enters and runs over to her. She tries to tell him of Stache’s betrayal, but dies in his arms before completeing her sentence. As JohnnyReb stands over Velvet’s limp body, Papa, Mama, Cliff, Stache and Banjovida (no longer in disguise) arrive. JohnnyReb is suspected of murder and banished to the Forbidden Island. Strangely enough, Danielle, plead with JohnnyReb to fight for his innocence. He goes willingly [Take It Easy] to the Forbidden Island however. Arch, who had seen the death and knows who is responsible, tries to get everyone to listen to him, but is characteristically ignored. Arch is also finally listened to. He points out that he saw Banjovida and Stache at the generator with Velvet when she died. JohnnyReb and Danielle indicate that the Councillors must be told. Increasingly it is observed that the dome is becoming unstable and Papa has an epiphany and decides to revert back to a moral stance. Instead of being intimidated, Papa says that he will invite the TechnoRemnants into Rockville to see whether they can help energise the dome with their different music. 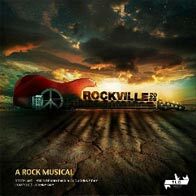 He creates a contest, a battle of the bands, in which the band which is able to generate the most energy into the dome take Rockville as the prize. He sends a message to the TechnoRemnants inviting them to participate in the competition. Papa is convinced that the people of Rockville have the music and the values of peace and love to win the contest and hopefully convert to the TechnoRemnants to their way of life. The dome, however, becomes more and more unstable as they approach full moon, keeping everyone on a fragile edge. Can music save the day? Each band is given a chance to energise the dome so that it glows brightly, but each band fails to do this completely. It looks as if the TechnoRemnants could take over. They have been musically underestimated. Danielle points out that JohnnyReb is a changed man and that Papa is no better than JohnnyReb used to be, given the way his own ego has grown. Papa realizes his failing and agrees to let JohnnyReb free to perform. In reality, however, it may be the last chance for Rockville to survive as all other options have failed.